Liposuction is a surgical procedure which aims to remove permanently localised deposits of fat. It is particularly useful where these deposits of fat are resistant to dieting and exercise. It works particularly well in patients who have good skin tone and isolated areas of fat excess eg. improving the shape of a patients legs, buttocks, hips, waist, abdomen, breast, back of the arms, chin, neck, chest, back as well as being useful in overdeveloped male breast tissue. Liposuction will not improve cellulite which is the appearance of dimpled irregular skin commonly seen in the buttocks and the thighs. It has no effect on stretch marks. It is not a treatment for obesity. Although it is a permanent removal of fat cells it is not able to remove all the fat cells therefore unless dietary and exercise habits change liposuction will not permanently correct obesity. It is important to have realistic expectations prior to proceeding with this surgery and we would advise that you contact Dr Belt’s rooms and his staff can answer any specific questions you may have and arrange for a quote and information regarding the procedure to be sent to you. Liposuction is a useful adjunctive procedure to be performed in combinations with multiple other operations. Liposuction to the area below the chin (submental) is performed routinely as part of a facelift procedure. Furthermore, liposuction can also be performed as an integral component of an arm reduction/brachioplasty as well as a medial thigh lift. Liposuction is also a very useful procedure to be done with other body contour procedures. 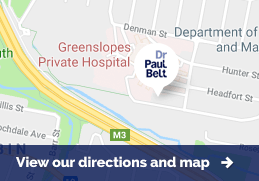 Dr Belt performs suction assisted liposuction and is also able to use the Tickle liposuction device through procedures, which are performed, at Greenslopes Private Hospital. This is a mechanical device, which produces safe and efficient removal of fat. Liposuction is a useful adjunctive procedure which can be used with any number of procedures. It is most frequently used in combination with abdominoplasty with liposuction to the flanks or love handle areas. It is also used for facelifts particularly to the area under the chin. Not all procedures are amenable to liposuction being performed at the same time particularly as this may undermine the blood supply to a particular area and increase the potential risks. These include Dr Belt’s fee, the theatre and day fee, a specialist anaesthetist fee as well as the costs of a support garment. Most patients will have the surgery performed as a day patient. This is not the case if more than three litres of fat is being removed. A tailor made tight fitting elastic support garment will be provided and this reduces the swelling in the treated areas and should be maintained for up to six weeks. Dr Belt recommends that the surgery is performed under a General Anaesthetic administered by a specialist anaesthetist. Exceptions to this are very small isolated deposits but the surgery can be performed under either sedation with Local Anaesthetic infiltration or for very small areas under Local Anaesthetic alone.